“If you can’t say anything nice, don’t say anything at all.” It’s a mantra taught to each generation because words have power: to build and destroy. The right words can make all the difference. Kind words spread positivity and help us develop more connected relationships with family members, friends, neighbors, and strangers. 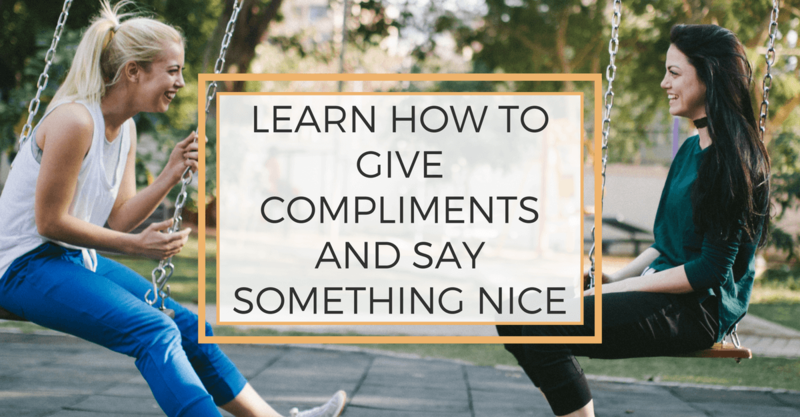 Learn how to give compliments and say something nice. It’s a small thing with a big payoff. We all know that receiving a good compliment can make us incredibly happy. But giving a compliment has the same power. If you’re looking to build better friendships, strengthen family bonds and spread joy in the world around you, learn to freely give heartfelt compliments. 1. Look for the good. If you look for the good, you will find it. Pay attention to the good things people are doing, and let them know you appreciate it. If your son has been more patient with his little sister lately, let him know you notice and appreciate it. If your neighbor grows beautiful flowers in her yard, tell her how much joy they add to your daily walks. If the grocery store employee did a great job bagging your groceries, let him know. Being genuine is the most important part of giving a compliment. Be sincere. Mean what you say. Don’t be fake. 3. Follow a compliment with a question. Giving a compliment and then asking a follow-up question makes it seem more genuine. “You gave an amazing presentation to the PTA today, how did you decide what to say?” “You are such a great mom, how do you stay so patient and calm with your kids?” This invites conversation and gives the person less of a chance to deflect your compliment. 4. Use a meaningful tone of voice. 5. Focus on character and accomplishments rather than appearance. Communicate that you see the person inside, and not just what they look like or the belongings they possess. 6. Find out what motivates the person and compliment that. If the person is interested in cooking, compliment the dish they brought to the potluck. If they are trying hard to get fit, say something about their motivation and perseverance. If you know they’re working on something that is hard for them, point out the progress you see them making. Give a compliment that applies to the situation you are in. Be empathetic. Put yourself in their shoes. That will help you think of something relevant to say. Make your English teacher proud – use your adjectives. 9. Say it with a smile. Smiling spreads positivity and compliments should always be positive – both to give and receive. 10. Have no agenda other than being nice. Say something nice because it’s true. Don’t have a hidden objective. Having an agenda makes the compliment null and void. It feels manipulative and like you’re trying to butter them up so they’ll do whatever you want them to do. Give written compliments on social media. We all love to read compliments and positive comments on our social media posts, so pay it forward. Don’t only “like” the picture, but say something meaningful and genuine to foster friendships. 12. Learn how to accept a compliment with grace. Simply say “Thank you, that is very kind of you to say.” Don’t deflect a compliment or feel compelled to offer one in return, which can feel insincere. As in all things, the more you practice, the easier and more natural it gets. Practice saying nice things and giving compliments daily. Practice on strangers. Practice on friends. Practice on your family. Practice on yourself. Spread positivity everywhere you go. Spread some sunshine and positivity by saying something nice. Sharing is Caring. Please Like, Share or Pin. Never miss a post. Subscribe to the weekly newsletter for small things tips, ideas, updates, and offers.